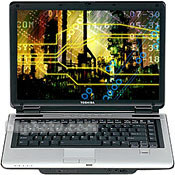 Toshiba M105-S3004 notebook features Intel Core Duo T2300 processor at 1.66 GHz, 14.1″ WXGA TFT TruBrite Active Matrix widescreen flat panel LCD, DDR2 SDRAM, 5400RPM hard drive, DVD SuperMulti optical drive, fingerprint reader, 802.11 a/b/g wireless networking and WiFi connectivity, Gigabit Ethernet, built-in media card slot writes and reads to 5 memory card formats. The Toshiba laptop weighs just under 7 pounds. Sci-Tech Today (dead link) reviews Toshiba M105s3004 laptop and concludes with rating of 3.5 out of 5 that thin and light, Toshiba’s M105-s3004 notebook PC is a good performer, but its underwhelming video setup and lack of antiglare technology detract from an otherwise impressive package.